A quick post about my website. I’ve finally had some time to put together my website for my business. 8mtech.com is online and has most of the pages complete. I’ve decided to keep the layout very simple and I’ll eventually flesh out the theme a little better. As an aside, my business cards came in, they were very nice. print100 based out of Hong Kong did a good job. $30 for 300 cards with corner cutting, matte finish and double-side colour. Very nice! Well, the past few weeks have been eventful and interesting. I’ve been busy and school is almost over. I’ve had a few things on the go and I’ve come up with some interesting ideas and implementations. Sorry for the lack of images in this post but I’ve been lazy taking them. This idea came from the need to build a measuring arm at a very low cost. I simply used some wood and some regular linear potentiometers. 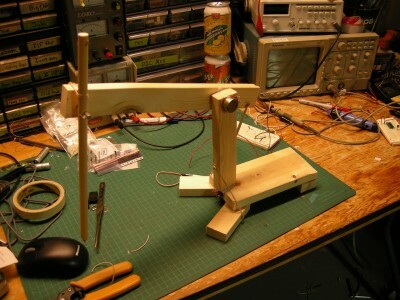 The cheap and quick measuring arm, this image doesn't show the wiring or the board behind it. This so far works reasonably, though it does have some linearity issues. I will need to bring this unit in to the shop to measure the joints and determine the exact positions in order to calculate the position. I was inspired by a fellow classmate to build a device for teaching children how to play the drums and other instruments. I can’t get into any hot and heavy details, however it was a success for two drums to be made. The sensors worked and transmission of the data was reliable and the software worked. It was a lot of fun to build and we may work further on the idea with better design specifications. My idea for an auditory camera level is working to an extent but I’m having difficulty filtering out the vibrations from arm shake and the like.